"What can we say about Biglietto per l'inferno that hasn't been told yet? A single LP, released in 1974 and followed years later by the posthumous Il tempo della semina, was enough to deliver the band to the history of Italian progressive rock, and much more. The eponymous debut album is always sold to collectors at very high rates, and is considered one of the must-have for any '70s prog-listener. What if the group didn't fold right after the release of their first LP? We can just imagine... and revive those moments thanks to some interviews and many photos displayed in books and on the Internet. 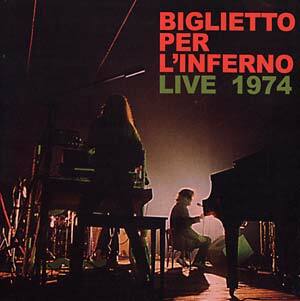 Live 1974 was recorded in Lecco on May 9th, and has miraculously survived the passing of time, hidden in some old tapes recently found by accident. This concert, which was released a couple of years ago as a paper sleeve CD and included in a beautiful celebratory box-set, is now pressed as a 180 gram audiophile black vinyl: a due tribute for an immortal band!" Housed in a full-color gatefold sleeve with a glossy, printed inner sleeve.